In the following 24 Hours Vancouver news story, PavCo Minister Pat Bell’s disingenuous and misleading responses about the giant video screen at Terry Fox Plaza are further exposed. When taking stock of opinions on the subject, at last count: The Vancouver City Mayor has asked that the screen be removed, City Councillor Geoff Meggs has said that residents were “ambushed” with this giant screen in their living rooms, Vancouver City By-laws dictate that the screen must be dismantled, MLA Spencer Chandra Herbert has stated that the screen must be taken down, and the overwhelming local resident outcry has demanded that the giant screen be immediately removed. When will the BC Liberals stop this daily harassment into our homes? 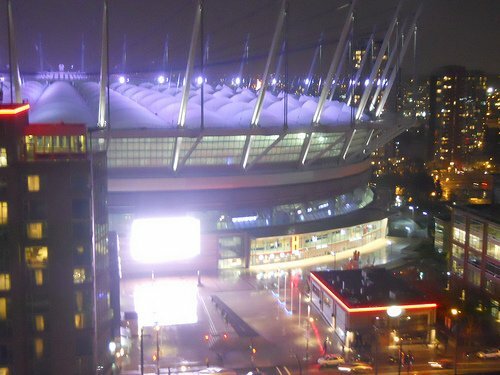 The province appears to be thumbing its nose at Vancouver residents, allowing a giant BC Place screen to beam ads into nearby glass condos because the provincial land it sits on is exempt from city bylaws. Residents around Terry Fox Plaza are up in arms, blinded by the flashing billboard, which is lit from 7 a.m. to 7 p.m. Many say the light wakes them, prevents children from sleeping, and floods living rooms in the early evenings. The advertisement screen is nearly 2,000 sq. ft. although a city bylaw allows just 200 sq. ft.
“The land that PavCo operates on is provincial land … so they are exempted from it,” a Tourism, Jobs and Innovation Ministry official said Tuesday. Last month Minister of Tourism Pat Bell told the B.C. legislature PavCo is working with the city to fix the problem. “Our senior staff say that’s not the case,” said Coun. Geoff Meggs, adding he can almost read the ads “with the naked eye” from his home in Fairview, nearly two kilometres away. A ministry official told 24 hours Bell’s office sent a letter about the screen to Vancouver’s mayor Monday, but wouldn’t reveal its contents. PavCo has reduced the screen’s operational time to 12 hours per day. “They’ve changed the time and reduced the glare a little bit but I think they’re hoping just by ignoring it and saying it’s solved, the people who’ve had their homes in some ways wrecked, give up and move away,” said Vancouver West End MLA Spencer Chandra Herbert, who represented the area before riding boundaries changed. He said residents are rightly concerned their home values have depreciated. No one from PavCo was available to comment. “You can’t be sitting anywhere within your glass home without this penetrating light flashing off all the surfaces within your home. We close our blinds but the light still comes through,” said David Cookson, who leads the group Take the Giant Screen Down Now. “We’re not talking about lights that serve the community; it’s something put up simply to blast advertising. “I understand the stadium is a good thing for the city’s economy. We all think the Whitecaps and Lions are great, we like entertainment, we like living in a bustling city, but this is so far beyond what’s considered acceptable."